Happy Tuesday! Not sure if you’ve been catching my home updates over on SnapChat, but over the last week I’ve been selecting fabrics and doing a bit of paint matching for the new place. Right now I’m working on my office, and found the coolest marble-print grasscloth for placing behind the bookshelves. It’s a subtle blush and white print, so I’ve been working on finding a paint color for the walls that will work with it! 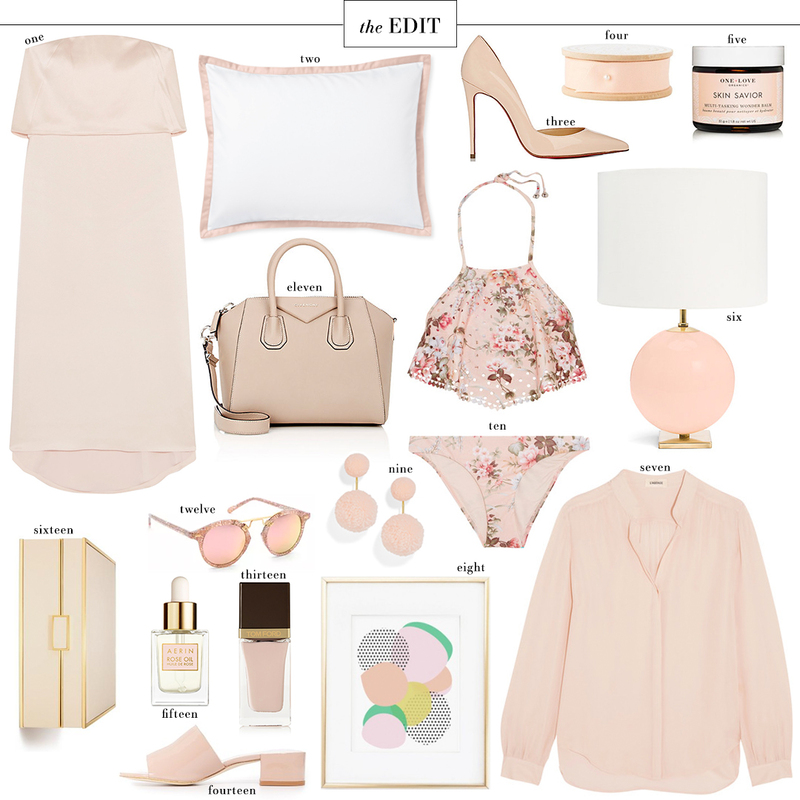 Clearly I’ve got blush on the brain, and it’s seeping right on through in this week’s EDIT. I’ve actually been seeing the return of colored denim, and while I’m not sure I can get behind bold colors, I can certainly get on board with a pair like this. So cute! One item I’d love to add to my wardrobe is a sleek Nancy Gonzalez clutch. They’re perfect for weddings, luncheons, church, really any dressy occasion! This simple crewneck sweater is easy and cozy for everyday wear at the office, but it’s got a little sparkle that makes it ideal for transitioning from day to night! This blush leather moto jacket is under $400 and offers the perfect edgy touch to such a feminine shade. This slinky top is perfect for pairing with jeans and heels for date night. Love the satin overlay! These silk-satin PJ’s are next on my list. They look so soft and pretty! A chic off-the-shoulder top for weekend wear that’s under $90? Yes, please. Love these baby pink finds. So chic & girly! And that floral bikini is too adorable. This soft blush pink color is my absolute favorite. Love all of this! Love the mule trend right now and those blush beauts are an awesome find!